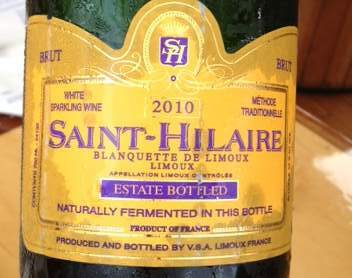 The 2008 St. Hiliare Blanquette Limoux, a blend of 98% Mauzac, Chardonnay, and Chenin Blanc from Languedoc, France. The second sparking wine that we tasted as we cruised north under the George Washington Bride, circling Manhattan with other cruisers, was this 2008 St. Hiliare Blanquette Limoux – a blend of 98% Mauzac, Chardonnay, and Chenin Blanc from Languedoc, France. Enjoyable for a variety of reasons, and in no small part because we wouldn’t normally pick up a sparkling or drift to French wines in general. As such, it was a nice change of pace from our domestic proclivities. This was paired with my favorite cheese of the day, a La Tur from the Piedmont area of Italy. The cheese was formed from a blend of sheep, cow, and goat’s milk–it was runny (“oozing” in the words of our host, not a description that I’d usually give to my foodstuffs) around the perimeter with a most, cake-like paste. Its flavor was earthy and full (“like ice cream served from a warm scoop”)–a truly enjoyable pairing. And on our tour of the world’s wines continues! This entry was posted in Champagne, Chardonnay and tagged France.